Last night was the deadline for filing appeals to the adoption of OOXML by ISO/IEC JTC 1. This morning, a spokesman for the IEC acknowledged the receipt of a total of three appeals by the deadline, with the third and final appeal being filed by India, as reported by Peter Sayers, of the IDG News Service. I have no news as yet whether the fourth country that planned to file an appeal has decided not to do so, missed the deadline, or sent its letter only to ISO (Peter reports that an ISO spokesman declined to confirm how many appeals it has received at this time. The deadline date is a matter of some confusion, as some National Bodies were under the impression that the deadline was June 2, so it remains possible that a fourth appeal will (or already has been) received. As with the other rules that have been at issue in the OOXML Fast Track process thus far, those that will apply here are superficially rational - but also superficial, when it comes to detail. As has consistently been the case to date, that means that a great deal is left to the discretion to those in the ISO/IEC hierarchy. What this means is that ultimate control of the resolution remains in the hands of the same individuals, and their colleagues, that made or approved, the decisions in the first instance upon which the appeals are based. See the full article for more details, including a summary table with Amazon, Netflix, iTunes, and others. Netflix got it right with the Netflix Player by Roku, a compact $100 Internet appliance from the video service known mostly for snail-mailing DVDs. It's simple. It works. It's not a world beater but it's plenty good enough. You can watch video streams of 10,000 items through the Roku box, just as you can using a Windows computer, as long as you have a modest monthly DVD subscription with Netflix. There's no extra charge for streaming content and no monthly limit. Time Warner Cable Inc <TWC.N> plans to offer subscribers an easier way to bring Internet video to their television screens as part of an overall home networking system, Chief Executive Glenn Britt said on Friday. "Right now it's pretty hard to get Internet stuff on your TV," Britt said at the Sanford C. Bernstein Strategic Decisions Conference in New York. "We're actually going to have equipment we make available to subscribers," he said. "It's actually going to be a new wireless cable modem that will allow you to network everything in your house." Google doesn't reveal exactly how many servers it has, but I'd estimate it's easily in the hundreds of thousands. It puts 40 servers in each rack, Dean said, and by one reckoning, Google has 36 data centers across the globe. With 150 racks per data center, that would mean Google has more than 200,000 servers, and I'd guess it's far beyond that and growing every day. Regardless of the true numbers, it's fascinating what Google has accomplished, in part by largely ignoring much of the conventional computing industry. Where even massive data centers such as the New York Stock Exchange or airline reservation systems use a lot of mainstream servers and software, Google largely builds its own technology. This is an interesting diversion, and suggests perhaps some ODF advocate vendors are getting better return-on-investment for their lobbying activities than, e.g., the Hillary Clinton campaign currently is. Associação Brasileira de Normas Técnicas (ABNT), the National Body representing Brazil, today filed an appeal to the approval of OOXML by ISO/IEC, bringing the current total of appeals to two, with as many as two additional appeals to come, based upon what I have heard from private sources. The text of the Brazilian appeal appears in full at the end of this blog entry, supplied by a trusted source in Brazil. While this latest appeal overlaps the South African objections in part, it also raises new concerns, some of which are particular to the interests of Brazil, rather than applying to the process as a whole. As a result, it raises not only additional issues, but also ones that present a categorically different basis for appeal as well. As we noted in the Burton Group report on this topic earlier this year, ISO standardization of OOXML will simplify business in some domains for OOXML-backing vendors (e.g., with governments and other organizations that mandate support for ISO standards), and will also continue to improve OOXML through an open, community-driven collaborative process, as the review culminating in the ISO vote a couple months ago clearly did. If a few national bodies are able to stall or torpedo the ISO OOXML standard, however, doing so certainly wouldn't somehow make it possible for ODF to leapfrog OOXML. OOXML is gaining market momentum primarily because it is robustly useful in real-world domains where ODF currently isn't, not because of the ISO seal of standards approval. I’ve been puzzling over transcripts of a couple of recent speeches by Microsoft Chairman Bill Gates where he discussed his vision for the end of phone numbers. But it wasn’t until today, when I learned more about Microsoft’s “Echoes” services platform for telcos that I began piecing together how Gates & Co. thinks Microsoft can do this. The looser coupling among identities, devices, and service providers is a bigger-picture trend, e.g., with SIP and services such as Google GrandCentral. Given the global reach and user base of related Windows Live services (for identity, authentication, presence tracking, contact management, rendezvous, etc. ), Microsoft is in a very good position to help accelerate the looser-coupling trend. It turns out MTV’s main deals with cable operators these days do give it the right to distribute all of its content online, said Mark Jafar, an MTV spokesman. And indeed it has started Webcasting some of its signature programs like “The Hills” and “SpongeBob SquarePants.” Comedy Central, however, was under a different set of contracts until early this year because Viacom only bought the network in 2003. Yahoo Inc Chief Executive Jerry Yang said on Wednesday a potential deal with Microsoft has tremendous power, but the software giant appears no longer interested in a full merger. State Street Corp. said yesterday that a disk drive containing personal details from 5,500 employees and 40,000 customer accounts was stolen from the office of another firm hired for data analysis. The incident could leave individuals open to identity theft and is the latest example to show how financial companies can be vulnerable to the physical loss of devices storing information, no matter how strong their online safeguards. South Africa may also have been swayed by arguments from Sun and IBM, said Rob Helm, director of research at the independent group Directions on Microsoft. The ISO OOXML process was "politically charged," Helm said in an interview. "All the vendors involved lobbied the national bodies heavily." But, Helm said, conjectures aside, South Africa's complaint raises valid points. You didn't really believe that the epic process of standardizing Microsoft's Office file formats had ended, did you? Last week, Martin Kuscus, CEO of the South African Bureau of Standards (SABS), formally appealed the International Organization for Standardization's (ISO) ratification of Microsoft's (NASDAQ: MSFT) Office Open XML (OOXML) as a standard for document interchange. The appeal puts the format's standards status on hold and possibly in jeopardy. Vic Gundotra, Google’s always enthusiastic vice president of engineering in charge of developer programs, said the announcements mark the coming of age of the Web as a programming platform. “If it was Windows versus the Web, the Web has won,” Mr. Gundotra said in an interview last week. That’s a claim that plenty of people — the armies of Windows programmers, for example, or Microsoft itself — are likely to find highly debatable. But the Web is getting better for programmers and that means ordinary Internet users can count on getting their hands on more powerful and useful Web-based programs soon. When it came time for the end-of-term study period, he [Zuckerberg] was too busy building the prototype of Facebook to bother to do the reading. So in an inspired last-minute save, he built a Web site with all of the important paintings and room for annotation. He then sent an e-mail to the students taking the class offering it up as a community resource. I think the "aren't beholden to shareholders" dimension is key; I'd add "often aren't beholden to customers," as in do-it-yourself support/etc., in many cases. ZDNet's Mary Jo Foley has posted a detailed report on Ozzie's talk. "BrowserPlus is a technology designed to 'extend the Web,' so that developers can build more exciting Web applications and so end users can get more done inside their Web browsers," Yahoo said on a BrowserPlus frequently-asked-questions page. Among its abilities: "Different Web sites can use BrowserPlus to support things like drag and drop from the desktop, easier file uploads, more efficient and secure acquisition of feeds and information, and native desktop notifications," Yahoo said. Developers using Google App Engine, which lets outsiders build Web applications on the same infrastructure that runs Google's own applications, will have a free quota of 500 Megabytes of storage and enough computing power and bandwidth for about 5 million pageviews per month. Microsoft Live@edu Delivers Exchange Labs to Students at No Cost: Momentum grows as thousands of colleges choose hosted communication and collaboration services from Microsoft Live@edu. Microsoft Corp. is adding no-cost Microsoft Exchange Labs e-mail for students and alumni to its Live@edu online communication and collaboration applications tailored for educational institutions. Live@edu with Exchange Labs gives students and alumni access to a reliable and security-enhanced e-mail experience similar to what they may use in the workplace, while university IT administrators can benefit from additional security features and simplified deployment. By bringing proven technologies to current education systems, Microsoft is helping IT administrators build closely connected infrastructures and create exceptional experiences for students and educators. Microsoft Live@edu, which also includes Windows Live Hotmail, Microsoft Office Live Workspace and Windows Live SkyDrive online storage, helps students manage their studies, share information and photos, collaborate with other students and faculty on projects, and stay connected easily with friends and family on campus and after they graduate. As Microsoft continues to assist universities in better meeting their technology demands in an increasingly Web-connected world, institutions are signing up for Microsoft Live@edu around the world, from Japan to South Africa to Brazil to the United States. Since the launch of Live@edu in March 2005, thousands of universities, colleges and schools in 86 countries have enrolled in the program, and momentum continues to grow as universities discover the numerous benefits of deploying Live@edu. The shortage of revenue among social networks, blogs and other “social media” sites that put user-generated content and communications at their core has persisted despite more than four years of experimentation aimed at turning such sites into money-makers. Together with the US economic downturn and a shortage of initial public offerings, the failure has damped the mood in internet start-up circles. Google's lawyers made the claim in papers filed in US District Court in Manhattan as the company responded to Viacom Inc.'s latest lawsuit alleging that the Internet has led to "an explosion of copyright infringement" by YouTube and others. Microsoft TV hasn't crested the hill yet, but it's getting a boost as TVs become more like computers, content goes digital and broadband ties it all together.Last week the group released a tool kit for its "Mediaroom" TV software platform, and later this year its software will appear in Xbox 360s that British Telecom will offer as set-top boxes. Troubled online news site RedHerring.com was inaccessible Friday for more than an hour. In the same week that the publication was booted from its offices in Belmont, Calif., Red Herring's Web site suffered a glitch Friday and didn't go back up until about 1:30 p.m., according to a source, who asked for anonymity. Red Herring is on at least one tech pub's "Death Watch" and the site outage might have led some to believe the company had finally packed it in. So here goes. Three years ago, we wrote a big story—but missed a bigger one. We focused on blogs as a new form of printing press, one that turned Gutenberg's economics on its head, making everyone a potential publisher. This captured our attention, not least because this publishing revolution was already starting to rattle the skyscrapers in our media-heavy, Manhattan neighborhood. But despite the importance of blogs, only a minority of us participates. Chances are, you don't. According to a recent study from Forrester Research (FORR), only a quarter of the U.S. adult online population even bothers to read a blog once a month. They are also a "powerful and engaging" alternative to more passive pursuits such as watching TV, said the BBC-sponsored study. The research was done with children using the BBC's Adventure Rock virtual world, aimed at those aged 6-12. Microsoft's Live Search Team is ending its book search efforts, according to a blog post Friday. Its Live Search Books and Live Search Academic sites will be discontinued next week, and books and academic publishings will show up in regular search results rather than separate sites. "We recognize that this decision comes as disappointing news to our partners, the publishing and academic communities, and Live Search users," read the blog post by Satya Nadella, senior vice president of search, portal, and advertising. When strung out in this manner, the pace of change seems breathtaking: from writing to the codex, 4,300 years; from the codex to movable type, 1,150 years; from movable type to the Internet, 524 years; from the Internet to search engines, nineteen years; from search engines to Google's algorithmic relevance ranking, seven years; and who knows what is just around the corner or coming out the pipeline? Meanwhile, I say: shore up the library. Stock it with printed matter. Reinforce its reading rooms. But don't think of it as a warehouse or a museum. While dispensing books, most research libraries operate as nerve centers for transmitting electronic impulses. They acquire data sets, maintain digital re-positories, provide access to e-journals, and orchestrate information systems that reach deep into laboratories as well as studies. Many of them are sharing their intellectual wealth with the rest of the world by permitting Google to digitize their printed collections. Therefore, I also say: long live Google, but don't count on it living long enough to replace that venerable building with the Corinthian columns. As a citadel of learning and as a platform for adventure on the Internet, the research library still deserves to stand at the center of the campus, preserving the past and accumulating energy for the future. Okay, this is non-techie, but it's still timely and interesting, if you don't consider economics "the dismal science"
This primer provides an overview of the SQL Server Data Services (SSDS, codename "Sitka"). It describes the SSDS data model and provides examples of using the data service. Microsoft (MSFT.O: Quote, Profile, Research) CEO Steve Ballmer said on Friday the acquisition of Yahoo (YHOO.O: Quote, Profile, Research) was never viewed as strategic and added the company had $50 billion to spend on other acquisitions. "Yahoo was never the strategy we were pursuing," he told a technology conference in Moscow. Data Management Strategies: DMS 2008 theme #1: DBMS redux, part 1: the end of the one-size-fits-all era? Is it the end of the road for RDBMSs as we've known them for the last ~25 years? Time to sell your SQL books on eBay, before they become worthless? To sign up for a distance-learning XML management course, in order to invest in your future career potential? Perhaps some of the "legacy" database models, such as hierarchical and object-oriented DBMSs, will finally start to gain (regain, for hierarchical) meaningful market momentum, with the market shift to XML for content and data? Is Oracle CEO Larry Ellison at risk of being bumped off the short list of the richest people on the planet (he's already down to #14 on this year's Forbes "The World's Billionaires" list...)? "... the Commission will investigate whether the announced support of ODF (Open Document Format) in Office leads to better interoperability and allows consumers to process and exchange their documents with the software product of their choice," it said in a statement. This sort of spin was inevitable, but it's very far off-track, imho. For example, it's impossible for Microsoft to support ISO OOXML until the standard specification has been published, and that's still in the future -- perhaps a year into the future -- so no smoking gun there... And, in the meantime, lots of enterprises and independent software vendors are already exploiting the (ISO OOXML precursor) ECMA OOXML standard that's supported in Office 2007 today. As for Microsoft supporting ODF in Office 2007 SP2, it's a pragmatic and, imho, politically astute move (as is Microsoft joining the OASIS ODF TC), but it hardly implies Microsoft favors ODF or is hedging on OOXML, and of course the PDF support was already there, albeit a mouse-click and download away (as is ODF support, albeit also a download away, and not officially supported by Microsoft today, and not as seamlessly integrated as it will be in Office 2007 SP2). Good news for those of you who have been following the XML office document standards battle. Microsoft today announced that Office 2007 will support ODF (Open Document Format), the document standard used by OpenOffice.org and other open source productivity suites, with the release of Microsoft Office 2007 Service Pack 2, due sometime in early 2009. Even more surprising, however, was the corollary to the announcement. While the Office programmer bees are busy buzzing away at ODF, OOXML (Office Open XML) is being put on the back burner. Don't expect Office to support a fully ISO-compliant version of OOXML until the next major release of the suite, currently codenamed Office 14, release date unknown. Any way you slice it, this is a big step toward shaking off Microsoft's dominance of the office software market and ensuring that we can all preserve our files for years to come. Yes on the latter; not likely, on the former. It is nearly a year now since Microsoft acquired Stratature, so it seems timely to reflect on what Microsoft is planning for its entry into the master data management (MDM) market. Microsoft's MDM product, code-named "Bulldog", is based on the Stratature technology, but is much more ambitious. The Stratature technology (the catchily named +EDM) was an inherently multi-domain MDM hub which was mainly aimed at the "analytic" MDM market, which is populated by the likes of Kalido and Hyperion DRM from Oracle. There is a lot more to this than just support for ODF in the Microsoft Office product, although obviously the native support for ODF is a focus for many of the words that have been written overnight. The company also announced plans to offer greater support for a number of alternative document formats - including Open Document Format (ODF) v1.1, Adobe Portable Document Format (PDF) 1.5, PDF/A and XML Paper Specification (XPS) - within Word 2007, Excel 2007 and PowerPoint 2007. In addition, Microsoft will support the future maintenance and evolution of these format standards by participating on the standards committees charged with these activities. This means that Microsoft folks will join the OASIS ODF TC and participate alongside IBM, Sun, Novell and everybody else present. Finally ODF will be added to the list of specifications that are covered by the Open Specification Promise, ensuring that every developer has access to any intellectual property that Microsoft might put forwards during these maintenance processes. As part of the program, Microsoft is also unveiling a new business model that allows search marketers to pay for ads only when people buy a product, rather than when they simply click on an ad. Microsoft said this so-called cost-per-action model would give advertisers more precise returns on their marketing budgets. Google already offers a program that allows advertisers to tailor their bids on keywords based on the number of actions, or conversions, they get. Microsoft also said that it had integrated Farecast, a travel Web site that Microsoft acquired in April, into Live Search cashback. The Live Search cashback service was built on technology developed by Jellyfish, a start-up that Microsoft acquired in 2007. The printer industry, they [People involved in shaping Google’s approach] say, is a perfect example. Canon supplies printer engines to about 80 percent of the laser printer market, including its rival Hewlett-Packard. They point to many others, including Whirlpool’s making appliances for Sears, AT&T’s licensing its mobile network to Virgin Atlantic and other small carriers, Toyota’s selling hybrid engines to General Motors and Microsoft’s tailoring its Office software for Apple computers. But some antitrust experts say the planned partnership does raise concerns. Whether this pact is completed or not, they add, it points to the kind of antitrust issues that will increasingly surround Google as a dominant company in the Internet economy, which can quickly magnify the market power of corporate winners. Microsoft Expands List of Formats Supported in Microsoft Office: Move enhances customer choice and interoperability with Microsoft’s flagship productivity suite. No doubt this will provide lots of conspiracy theory fodder for anti-Microsoft types worldwide, but imho this is another example of how Microsoft is doing some surprisingly pragmatic and customer-focused things these days. Read the full press release and think about the implications. Microsoft Corp. is offering customers greater choice and more flexibility among document formats, as well as creating additional opportunities for developer and competitors, by expanding the range of document formats supported in its flagship Office productivity suite. A $75 dual-screen Windows-based (maybe the Windows option would raise the price to, say, $100 :)...) ebook reader/tablet/laptop? "This laptop comes from a different point of view." he said. The new version loses the green rubbery keyboard, sporting instead a single square display hinged at its centre. This allows the device to be split into two touch screens that can either mimic a laptop with keyboard or the pages of a book. "Over the last couple of years we've learned the book experience is key," he said. The idea is for several children to use the device at once, combining the functions of a laptop, electronic book and electronic board. That would be pretty cool. But in the meantime, who is going to pay ~$200 for one of these? At the briefing, Rabbi Abraham Cooper, an associate dean at the Simon Wiesenthal Center, a Jewish human rights group based in Los Angeles, presented the organization’s annual study of online terror and hate. He said the group had identified some 8,000 problematic sites in the last 12 months, a 30 percent spike over last year. The aQuantive combination has gone well thus far, executives and analysts said. But there's more work to be done, particularly in uniting the advertising platforms that underpin the company's play in the $22 billion online advertising industry. And compared with the daunting task of swallowing Yahoo, with its dramatically larger size, hostile management, incompatible back-end technology and different corporate culture, aQuantive is a relative snack. The software maker plans on Wednesday to launch a cash back program to those who buy things after using its search. Microsoft has details of the program up on its Web site, including a list of frequently asked questions. "We want to earn your loyalty and reward it with cashback savings for your everyday online shopping," Microsoft said. "We are 'The Search That Pays You Back!' "
More details on the ($100 - $25) laptop. I sense strong potential for the Osborne effect here -- who is going to buy $200 "$100" laptops when much-improved $75 versions will be available in 2010? With its hinged dual display, the new version could be used as a book, as a laptop with a touch-screen keypad, or as one continuous display when folded flat. 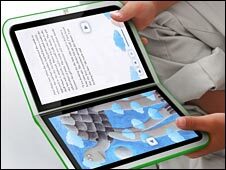 "The display is going to get better and better, and it's key to the next generation," Nicholas Negroponte, founder of OLPC, said yesterday at a launch event at the MIT Media Lab. Mr. Pickens in an interview on CNBC Tuesday said he had bought 10 million shares of Yahoo, or a roughly 0.75% stake, after Mr. Icahn launched his proxy effort. "I'll jump in with Carl. He goes in first, I jump in behind him," Mr. Pickens said during the interview. A spokesman for Mr. Pickens declined to comment further. Mr. Icahn couldn't be reached for comment. Mr. Icahn last week disclosed he had bought 10 million Yahoo shares and acquired options to purchase 49 million more, which together would represent a roughly 4.3% stake in the company. Other Icahn supporters include hedge-fund investor John Paulson, whose Paulson & Co. firm, held 50 million Yahoo shares, or a 3.7% stake, as of the first quarter. Mr. Paulson in a statement last week said he intended to vote for Mr. Icahn's nominees but hoped Microsoft would reach an agreement to buy Yahoo before then. Nicholas Negroponte, founder of the One Laptop Per Child Foundation, revealed plans for the new computer at the Massachusetts Institute of Technology Media Lab yesterday. Due for release in 2010, the new machine will be smaller and lighter than the foundation's current XO laptop, which went on sale last year. But the new device will feature two video display screens, one of them replacing the keyboard found in other laptops. The screens will be touch-sensitive, and can be configured to act as a traditional keyboard. But the screens can also serve as a single large viewing area. You probably noticed the byline on my recent Yahoo! developer network posting. It, and a few more posts still in the pipe, list me as a “SearchMonkey Team Alumnus”. So yeah, it’s official, I’ve hung up my exclamation point and moved on to something else. Specifically, Mark Logic, where a group of impressively talented people reside, recently including Norm Walsh. My first day there is tomorrow, so I don’t fully know what I’ll be working on, though it does involve the core server, and taking it from it current state of awesome raw bare-metal power into something more akin to a application development platform. This is just my speculation -- I have no info from Microsoft on this scenario -- but I'm expecting Windows 7 and Office 14 will be the main themes at PDC 2008. When is Microsoft finally going to start sharing information on Windows 7? After all, if the Redmondians stick to their own oft-quoted ship target of 2010 for the operating system, that is just two years away. For developers two years isn’t a whole lot of time when trying to make decisions about whether or not to build a new product that will be designed specifically to take advantage of new features and functionality in a new Windows release. And for IT managers struggling with deployment plans (as in deploy Vista now or wait two more years for Windows 7), that window on the next version of Windows isn’t overly wide, either. An example of OOXML generation from Altova -- see the full post for screen shots etc. One take-away from this article: it's now likely up to Google or Microsoft, winner takes all (of Yahoo), and of course there's a very low probability, given Google's already dominant search market share, that it would be allowed to acquire Yahoo. Press F9, and the answer is... a very risky scenario for Carl Icahn, if Microsoft opts to not put an offer back on the table. Whatever the case, his role in Yahoo is not just like any other shareholder. He’s gambling that Microsoft will inevitably come back to buy Yahoo — and if it doesn’t, that he will be able to use his special brand of influence to make it. Google's top executives have said they'd like to offer Yahoo a helping hand in their travails to fend off Microsoft, then activist shareholder Carl Icahn, and now Microsoft again. And Brin went one step further, saying he'd give Yahoo CEO Jerry Yang refuge within Google if he's ousted from the Internet pioneer, according to press accounts. Reading between the lines, I think it's possible that any price Google might pay for a similar deal with Yahoo just went up -- way up... If the unofficial accounts quoted below are accurate, I also can't imagine why Yahoo would opt to disassemble itself. Under its latest proposal to Yahoo, Microsoft would buy its search business and take a stake in the company, people briefed on the negotiations said Monday. As part of a complicated deal, Yahoo would spin off its Asian assets, which include a stake in the Alibaba Group, a Chinese Internet company, these people added. The proposal, which is subject to change, is an effort by Microsoft to scuttle a search-related advertising deal between Yahoo and Google, and could expand into a full-scale takeover. I remember an exchange between Bill Gates and Jim Manzi, back in the early 1990s, when the PC software business was still relatively young, and the productivity application suite market was taking off (e.g., Microsoft Office versus Lotus SmartSuite). Bill Gates commented, when asked about a price war phase in the suite competition, "It's not a good idea to get into price competition with someone who has more money than you do." Working with a small Silicon Valley company, Netflix will begin marketing a $99 device on Tuesday that will allow customers to play thousands of movies and shows on their televisions instantly, for no charge beyond their normal subscription fee. The size of a paperback book, the set-top box is made by Roku, a Saratoga, Calif., start-up known for its Internet music players. Netflix, based in nearby Los Gatos, owns a small stake in the company. The Internet search giant’s service, Google Health, at google.com/health, is the latest entrant in the growing field of companies offering personal health records on the Web. Their ranks range from longtime online health services like WebMD to the software powerhouse Microsoft to start-ups like Revolution Health. In plainer language: after a week of analysis, we now know that two changed lines of code have created profound security vulnerabilities in at least four different open-source operating systems, 25 different application programs, and millions of individual computer systems on the Internet. And even though the vulnerability was discovered on May 13 and a patch has been distributed, installing the patch doesn't repair the damage to the compromised systems. What's even more alarming is that some computers may be compromised even though they aren't running the suspect code. Today it's releasing Wetpaint Injected, a slick new technology for adding interactivity and secret Google juice to Web sites. Buzz has grown since details surfaced in March, and last week DAG Ventures and an unnamed person added $25 million to Wetpaint's $15 million in funding. The technology was code-named "Balco," a reference to baseball's steroids scandal, because it's a performance-enhancing substance that can be injected into Web sites. Hot or Not, a Web site where people submit photographs of themselves so that strangers can rate how attractive they are on a scale of 1 to 10, has spawned many imitators (plus a fair number of critics who view it as a sign of the end of civilization as we know it). One new spinoff, Pos or Not, has a serious purpose (tasteful or not). The site, www.posornot.com, introduced in late April, is an H.I.V. education effort disguised as a game. It shows photographs and brief biographies of men and women ages 21 to 30, and asks visitors to decide whether each is H.I.V. positive or negative. The message is that you can’t judge someone’s virus status by looks, occupation or taste in music. A Microsoft strategy snapshot -- see the full article for the rest of Kevin Johnson's letter, including actions 4 - 8. 1. Innovate and disrupt in search - We will disclose some elements of our plans with this week's release of search and sharpen our focus on user experience and business model innovation. The work we have done over the last 4 years on search has established a solid foundation to build upon. 2. Win targeted distribution - With this release of search, we are now ready to throttle up broader distribution initiatives. 3. Reinvent portal and deliver new experiences across PC, phone and web - We are building our new releases of Windows 7, Windows Live wave 3, Windows Mobile 7, Internet Explorer 8, Search and MSN with an eye towards optimizing and unifying experiences and scenarios. Microsoft Issues Statement Regarding Yahoo! : Microsoft announced that it is continuing to explore and pursue its alternatives to improve and expand its online services and advertising business. “In light of developments since the withdrawal of the Microsoft proposal to acquire Yahoo! Inc., Microsoft announced that it is continuing to explore and pursue its alternatives to improve and expand its online services and advertising business. Microsoft is considering and has raised with Yahoo! an alternative that would involve a transaction with Yahoo! but not an acquisition of all of Yahoo! Microsoft is not proposing to make a new bid to acquire all of Yahoo! at this time, but reserves the right to reconsider that alternative depending on future developments and discussions that may take place with Yahoo! or discussions with shareholders of Yahoo! or Microsoft or with other third parties. Burton Group has introduced a new research offering, its Data Management Strategies (DMS) service. As with the other Burton Group services, DMS is focused primarily on enterprise information technology domains (commercial, government, and higher education), and includes a mix of published research content and customer interaction in the forms of telebriefings (web conference presentations with Q&A) and dialogues (on-demand discussions with analysts). You can find more details about the new DMS service on this page. I'm the Research Director for the DMS service, and I've been focused on bootstrapping the DMS team for the last few months. I'm psyched about the DMS team and the opportunity to focus full-time on data-related topics, as I've been something of a data zealot for most of the last 25 years. While many people are familiar with my collaboration-related experience, e.g., running Notes product management at Lotus Development Corp. and working in product management and competitive strategy at Groove Networks, my inner data-geek goes back to 1982, when I started in my first database application developer/programmer job. After a couple years of working on minicomputer DBMS applications, I went to graduate school at the University of Minnesota, where I learned a lot more about DBMS topics and was also introduced to conceptual data modeling, in a class with John Carlis (co-author of what I still consider to be the best data modeling book, Mastering Data Modeling: A User-Driven Approach; the book's other co-author, Joe Maguire, is a member of the new DMS team). After graduate school, I had the privilege of working in database-related applications and data architecture for Procter & Gamble. To give you an idea of how different the DBMS landscape was at that time (mid-1986), one of my first tasks at P&G was to establish SQL as a global P&G standard, something that was, at the time, quite controversial (in part because P&G had, a year earlier, made a global commitment to IDMS, a pre-relational DBMS). I also had the opportunity to work with Metaphor Data Interpretation System applications at P&G -- then very leading-edge stuff, with workstations and database machine-based servers that made the PC client/server systems at that time (and some of today's leading database products as well...) seem primitive in comparison. My Metaphor and other database-related experience at P&G turned out to be very relevant for Lotus Development Corp. in mid-1988 -- Lotus was then working on a set of database tools, code-named "Baseline," and I made the jump from the enterprise IT database domain to the weird and wonderful world of software product development. The late 1980s and early 1990s were a very dynamic time in the PC database business, and some of the brightest database people I've had the privilege to work with were on the Baseline team, but the product never shipped (a long story -- partly due to a focus on OS/2, partly a fateful decision to base a desktop database tool on the 1-2-3/G n-dimensional spreadsheet engine...). I eventually concluded the world of software product management and marketing was a little too out-there for my career, and switched back to enterprise IT mode; in 1990 - 1991, I led an IT team at Lotus that rolled out the then-fledgling PeopleSoft system, running on a very expensive (and now positively quaint) Compaq server running Microsoft SQL Server on OS/2. I next embarked upon what became an approximately 15-year career detour into collaboration software, joining the Lotus Notes team in 1992 (with an initial focus on Notes/DBMS integration) and focusing mostly on Notes-related activities until I left (what had by then become IBM Lotus) for Groove Networks about a decade ago. I made another career change in 2000, in my first stint as an industry analyst -- I covered early .NET topics and the then-new web services domain for the Patricia Seybold Group, before jumping back into the software product side of the business as VP Strategy for Macromedia. I continued to apply data modeling throughout these job experiences, e.g., building a conceptual data model of Notes with the product's lead designer in the Notes 3.x/4.x period, and using data models to analyze products ranging from web app servers to productivity apps (e.g., creating a conceptual data model of Microsoft's smart tag technology, in 2001). I also continued to occasionally build databases and apps along the way, ranging from some non-profit volunteer work using dBASE in the mid-80s to freelance database design for a sports-oriented web site start-up in the late 90s. I've been at Burton Group for ~4.5 years now, starting in Burton Group's Application Platform Strategies (APS) service in 2003 and later working as the founding Research Director for Burton Group's Collaboration and Content Strategies (CCS) service. I wrote a couple database-related APS reports, snuck a few conceptual data model diagrams into my CCS reports, and closely tracked the rapidly-evolving market dynamics at the intersection of XML and data-stuff. Since early 2008, I've been stealthily building the new DMS service. I started by recruiting some of the brightest data folks I've met over the last 20 years, and then collaborated with the new DMS team to formulate a research agenda and start writing research documents. We launched the DMS service today, and published our first few DMS research docs; you can grab a complimentary copy of one of the documents (on conceptual data modeling, written by Joe Maguire) on this page, to get a sense of the DMS focus and style. America’s politics have regularly been transformed by sudden changes in the way we communicate. And revolutions in communications technology have always bestowed great gifts on those politicians savvy enough to grasp their full potential. It is still unclear how far Barack Obama’s talent for online campaigning will take him. But it’s worth noting that some of the best-known presidents in U.S. history have stood at the vanguard of past communications revolutions—and that a few have used those revolutions not only to mobilize voters and reach the White House but also to consolidate power and change the direction of politics once they got there. The second article "The Amazing Money Machine", is about "How Silicon Valley made Barack Obama this year’s hottest start-up"
Japanese superhero Ultraman vanquishes an evil enemy during a live performance at a Tokyo games arcade. But Ultraman's real battle is proving much harder -- enticing customers back to the nation's arcades. Japan's $6.9 billion arcade industry has been whacked hard by new advances in gaming, particularly Nintendo Co Ltd's wildly popular Wii, the latest big craze to compete for the time and pocket money of Japanese kids. Similarly, two successive Microsoft chief executives have long tried, and failed, to refute what we might call the Single-Era Conjecture, the invisible law that makes it impossible for a company in the computer business to enjoy pre-eminence that spans two technological eras. Good luck to Steven A. Ballmer, the company’s chief executive since 2000, as he tries to sustain in the Internet era what his company had attained in the personal computing era. Empirical evidence, however, suggests that he won’t succeed. Not because of personal failings, but because Mother Nature simply won’t permit it. According to Mark Bauerlein, an English professor at Emory University and author of “The Dumbest Generation”, leisure reading among American 15-to-17-year-olds fell from 18 minutes a day in 1981 to seven in 2003. Electronic media, of one sort or another, now occupy every spare moment. Mr Bauerlein fears that, far from opening new vistas for learning and awareness, digital technology has fostered a level of public ignorance that now threatens not just our competitive wellbeing but our democracy as well. To some extent, government statistics bear him out. Proficiency scores in reading, writing, science and mathematics for American teenagers in their last year of high school all fell between 1992 and 2005. Only one in three children left high school able to read proficiently. Only one in four could write a coherent paragraph. I finished reading Mary Jo Foley's new book yesterday. I consider it required reading for anyone interested in Microsoft's past/present/likely future. It's an in-depth and, imho, refreshingly objective assessment from a top-tier tech journalist who has been closely tracking Microsoft for a couple decades. Check it out at Amazon.com. Microsoft 2.0 is about Microsoft's future, not its past. The coming years will be challenging ones for the Redmond software kingpin. Many of the executives currently leading the Microsoft charge are likely to go their own way. Technology will continue to advance at a breakneck pace. Microsoft will forge deals of the size and scope it previously never envisioned in order to keep pace. Foley doesn't claim to possess a crystal ball, allowing her to predict flawlessly what Microsoft plans to do in the next few years ? or even few months. But based on the many Microsoft executives, partners, customers and competitors with whom she converses regularly, she is sitting in a good spot to make some fairly educated guesses that will be most interesting to her readers. This book describes the Microsoft people, products and strategies that will be key for the next-gen Microsoft. Foley uses her professional experience to piece the puzzle together in order to reveal a reasonable, educated guess as to what Microsoft 2.0 will look like as it enters the next decade and beyond. Just got a nervous call from my lawyers who said they wanted to give me a "heads up" about a "situation" at Broadcom. See more about it here. Basically the feds are going after some Broadcom execs over some options backdating stuff. I'm like, So what? I don't work at Broadcom. They're like, Um, well, see, Broadcom did its own internal investigation and already cleared these guys, and the SEC isn't buying it apparently, and though the company itself has already settled the whole thing the SEC is still going after the executives as individuals. Now you do you see? Is this ringing any bells? WinFS was an ambitious effort to embed an integrated storage engine into the Windows operating system, and use it to create a shared data ecosystem. Although WinFS never shipped as a part of Windows, many of the underlying technologies have shipped, or will ship, in SQL Server and in other products. In this interview Quentin Clark traces the lineage of those technologies back to WinFS, and forward to their current incarnations. For Mr Yang personally, the long term looks like it just got shortened considerably. Having spent much of the year fending off Microsoft ’s chief executive, Steve Ballmer, who had strived to stay scrupulously polite despite his mounting personal frustrations, the Yahoo boss on Thursday came under the far more caustic fire of Carl Icahn. "This is all about bringing investors better, faster, more meaningful information about the companies they own," said SEC Chairman Christopher Cox. "It would transform financial disclosure from a 1930s form-based system to a truly 21st century model that taps the power of technology for the benefit of investors." The One Laptop Per Child Foundation, of Cambridge, will next month start distributing a version of its XO laptop that will run Microsoft Corp.'s Windows operating system. While the move has long been expected, it represents a major shift for OLPC, which has relied on the free Linux operating system. 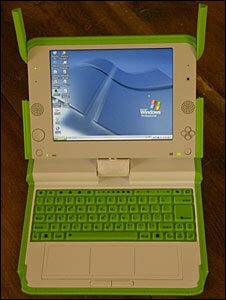 "It's not about the operating system, it's about the educational experience," said OLPC's chief executive, Chuck Kane. He said the foundation's Sugar suite of educational software is being modified to run atop Windows. The tension mounts... See the full article for more details; apparently Yahoo's board has been much more responsive to Icahn than they were to Microsoft. Icahn said in a letter to Yahoo's board that a combination with Microsoft "is by far the most sensible path" if the Internet company wants to take on Google Inc.
"The board of directors of Yahoo has acted irrationally and lost the faith of shareholders and Microsoft," said Icahn, 72. "I sincerely hope you heed the wishes of your shareholders and move expeditiously to negotiate a merger with Microsoft, thereby making a proxy fight unnecessary." Google Maps now can show real estate listings, presenting pushpins that show houses for sale. To show real estate results, click "Show search options," then select "Real Estate" from the drop-down list. The Web site then shows a list of properties for sale on the left tied to pushpins on the map on the right. In simple terms, Comcast wants to be a sort of Facebook of video sharing. As Mr. Schwartz explained it, if you love an episode of “Lost,” you will eventually be able to use Plaxo’s multi-platform connection technology and Comcast’s video-licensing agreements to share it with your friends. “We can bring you the show,” he said. Plaxo, based in Mountain View, Calif., had been looking for a buyer since at least January. Comcast was a natural partner since Plaxo was already providing the Philadelphia-based cable giant with software to help integrate its cable TV, phone and Internet services into a common platform. Comcast Corp. said on Wednesday that it will acquire networking Web site Plaxo, in an effort by the cable operator to broaden its range of services. Terms of the deal weren't disclosed. Plaxo, a closely held company based in Mountain View, Calif., offers technology that helps users more easily share contact information and media such as photos or personal Web-site information. A generation of unprecedentedly large and fast iPod docks is now on offer, and it has now been announced that firm customer orders have been placed. 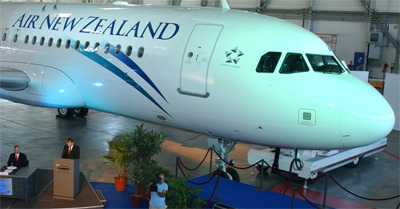 Air New Zealand will equip eighteen of its airliners with in-flight entertainment rigs allowing iPod users to play their video on seatback screens, listen to audio through the aircraft system, and control their device via the plane's interface. The countersuit exposes how the tension between the companies has been growing since shortly after eBay’s 2004 purchase of a 28.4 percent interest in Craigslist. Craigslist’s suit says eBay has continually tried to exert control over Craigslist, a privately held company in San Francisco that is widely known for its anticorporate philosophy. It revealed that eBay acquired the shares by buying an option to acquire the shares of a minority shareholder of Craigslist, whom the company did not identify. The suit said that because eBay’s option prevented Craigslist from finding another buyer, Craigslist then repurchased the shares and issued new shares to eBay. For IBM, the king of the IT services business, imitation is the sincerest form of flattery. But if Hewlett-Packard thinks its purchase of EDS will immediately put it toe-to-toe with the market leader, IBM’s own long and difficult ride in services should make it think again. IBM Global Services, which accounts for more than half of the Big Blue’s revenues, has rebounded to become the main driver of the company’s earnings since the middle of last year. After a period of negligible growth, it has taken a radical restructuring and new leadership to revive the business, lifting growth back to 9 per cent in the first quarter even before the benefit of currency fluctuations. Database maker Vertica Systems is moving its technology to Amazon's Elastic Compute Cloud infrastructure (EC2), hoping to score customers who want a hosted, pay-as-you-go model for data warehousing and BI (business intelligence), the company announced Monday. Short version: Wetpaint might be one to watch. Long version: TechCrunch's Michael Arrington has alerted us to a dark horse candidate in the race to dominate the land of wikis. It's Wetpaint, a Seattle-based service we haven't heard a whole lot from lately. The reason, Arrington says, is that it's positioning itself to be a player in niche social networks, not just mini-Wikipedias. The activist investor is considering beginning a proxy fight at the Internet media company, fewer than two weeks after it rebuffed a takeover offer from Microsoft, a person briefed on the matter told DealBook. Mr. Icahn began stockpiling a large stake in Yahoo, one as large as 50 million shares. The move would be reminiscent of his role in orchestrating a deal between Oracle and BEA Systems last year. Then, Mr. Icahn took a position in BEA, an enterprise software maker that rejected Oracle’s advances. After a convoluted series of events, including some strong-arming by Mr. Icahn, BEA finally submitted to an Oracle takeover. The eventual limits of the fast-growing search market, which accounts for almost half of all online advertising, are still impossible to discern, but it is already a business that stands comparison with the technology industry's most fabled success stories. On the current trajectory, Google's revenue - almost all of it coming from search - will probably surpass the income that Microsoft generates from the Windows operating system some time next year. There is no guarantee that the search company will alight on another idea as powerful as its advertising system, says Mark Anderson, a veteran technology commentator. Yet that may not matter for some time, he and most other industry insiders say. "I think it's enough for the next 10 years," says Mr Anderson. "When God gives you a golden goose, you have to hold it tight."